After Student is Suspended and Arrested for Wearing NRA “Protect Your Rights” Shirt, 100 STUDENTS WEAR SHIRT TO SCHOOL! HAHA! Remember the kid in West Virginia who got suspended from school and arrested(!) by the local police for wearing this NRA shirt? Well, he was re-instated (under threat of massive lawsuit), and the day he came back to school, OVER 100 STUDENTS show up wearing the same shirt! 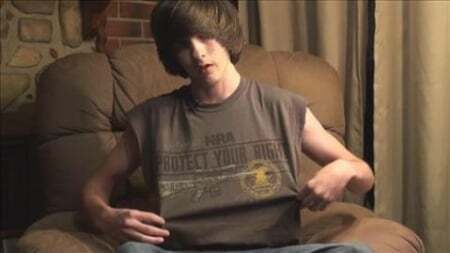 When Jared Marcum was suspended from school and arrested for wearing a NRA “Protect Your Rights” t-shirt, it drew national attention. Afterwards, the liberal bullies at Logan County Schools who thought they could get away with picking on a 14 year old kid started to become a lot more reasonable. It didn’t hurt that a video turned up that showed a teacher yelling at Jared for refusing to turn his shirt inside out, while his fellow students were chanting his name in support. Although the petulant school did not apologize or talk to Jared’s father, his suspension turned out to only be a day long. The Marcum family, their lawyer Ben White and the gun rights group Sons of the Second Amendment didn’t just meekly accept the school’s non-apology. Jared Marcum returned to school wearing the SAME SHIRT. Moreover, he was joined by 100 other students wearing NRA “Protect Your Rights” shirts that were provided by Sons of the Second Amendment. None of them were suspended or arrested for wearing the shirts. Don't mess with West Virginians, you leftist teachers. Don't shoot, bro! We're not Dorner! they were chasing rogue cop Sgt. Christopher Dorner? A judge awarded the two ladies who owned this truck (which they used for their newspaper-delivery business) 4.2 MILLION IN DAMAGES! And, a new truck to boot. Way to go, LAPD! Super professional! Only cops should have guns, eh? Good grief, what's the crime in that? I'm sorry, but New York City just isn't American. If you are this afraid of BB guns, you should be in a psych ward, or leave the country. It's not the homeowner, rather the intruder. Toledo police say it happened in the 4500 Block of Douglas Road. The homeowner, Brian Loyer, woke to the sound of his side door being kicked in. He grabbed a gun and announced he was armed, but the suspect, 24-year-old Lucas Hassen, continued his attempt to get inside, according to police. Loyer fired, hitting Hassen, who fled and collapsed in the backyard of Joan Rutherford. *SNIFF* I just love happy endings. 'Bulletproof glass' isn't for rifle calibers. themselves caused by disarming everyone but the criminals. ANY 30-caliber or greater rifle, including your granddaddy's 1903 Springfield (which shoots that newfangled .30-06 cartridge--oh wait, that was introduced over 100 years ago) can punch holes in so-called "bulletproof" glass. The police should not be surprised by this, but many are, since few actually have broad firearms experience. "The Utopian schemes of levelling [wealth redistribution], and a community of goods, are as visionary and impracticable, as those which vest all property in the Crown, are arbitrary, despotic, and in our government, unconstitutional. Now, what property can the colonists be conceived to have, if their money may be granted away by others, without their consent?" Samuel Adams, in a letter to fellow founder Dennys De Berdt, January 12, 1768. Yeah, the Founders were well aware of socialism. AND THEY DESPISED IT.